I'm a huge fan of leopard print accessories, and posted a few months ago about my love for heels in the spotty-wonderful print. I really didn't think a flat shoe could surpass a love for a heeled one, but AW12 is proving full of fashion surprises. I have well and truly fallen for a slipper. I wore them out on Saturday afternoon to meet friends for an 8 hour Wahaca food/mojito binge, neither of them believed me they were from Clarks until I showed them the stamp on the sole. They really are brilliant - and very, very comfortable. Buy them here if you love them as much as I do! Animal prints are one of the dangerous things; too little and you've missed the boat, too much and you look like you belong on a street corner, and not in a getting-papped-by-Scott-Schuman way. But in a nutshell, you are going to need a pair for this winter - they'll be fab for the British autumn too. You can spice up a plain outfit with them at work, or be the last one standing on a night out in them with the girls. Slippers are a winner! 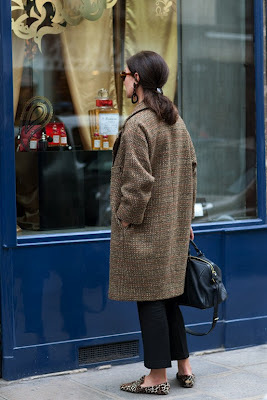 Hello, on the first picture the coat rocks, do you know the brand ?